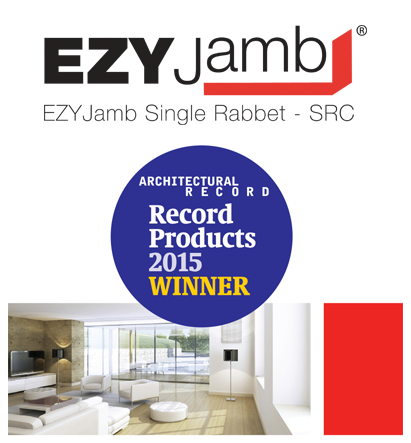 Priority Door & Window Products is pleased to offer the EZY Jamb line of quality products. They have created architectural solutions for a flush finish door jamb system that provides clean lines and contemporary finishes. EZY Jamb is American made and a Green Accredited company that we are proud to display in our showroom. Come in to operate this industry leading product today. Click here to learn more about Priority Door & Window. For many years, architects, interior designers and developers have been trying to produce a contemporary flush finish door jamb with clean lines and inconspicuous detail. EZY Jamb does just that! EZY Jamb steel door frames are Manufactured by STUDCO Building Systems who specializes in the manufacturing of quality rollformed steel building products. EZY Jamb is committed to fulfilling the most challenging customer requirements and is constantly seeking to introduce and implement new viable systems for the construction industry worldwide. STUDCO is a quality accredited company to ISO 9001 and is dedicated to offering quality products with personalized efficient customer service. EZY Jamb is a split type jamb manufactured form cold rolled steel with a patented profile to produce a strong and secure assembly. The unique design of EZY Jamb combines visual appeal, strength and versatility. • Designed for quick and economical finishing of wall ends. • Manufactured from cold rolled steel providing a strong and secure wall end cap that is both durable and fast to install. • Hard to reach wall ends made possible with Ezycap®. • Available in a range of sizes to suit various wall configurations. To suit any pocket door. 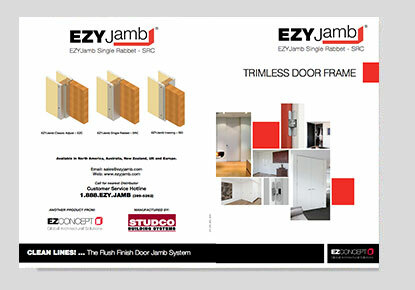 Click here to download an EZY Jamb brochure for more information. Ezy-Jamb is simple to install, and it requires no special maintenance. The jamb is a split-type and comes in two sections that fit neatly together and provides adjustability in wall thickness. The system is complemented by a range of hardware to suit different applications. We offer competitive pricing, excellent service, and professional support. Priority Door & Window Products is a San Diego based company who specializes in selling high quality door and window products direct to homeowners and construction professionals since 1981. Priority Door & Window Products is one of the leading suppliers of high quality replacement windows, bi-fold sliding doors, multi slide doors, and folding glass patio doors in San Diego, CA. We proudly serve the following areas: La Jolla, Del Mar, Coronado, Rancho Santa Fe, Dana Point, San Clemente, Laguna Beach, Cardiff, Encinitas, Missions Hills, Point Loma, Solana Beach, Alpine, Ramona, San Marcos, Carmel Valley, Chula Vista, El Cajon, Escondido, Poway, Spring Valley, Temecula, Vista, and surrounding areas in San Diego County. Call us today at 619-281-2333 for an estimate or drop by our showroom at 4606 Mission Gorge Pl # A San Diego, CA 92120 and check out our wide selection of quality door and window products.